Blog — Francis Family Renovations, Inc.
Thanksgiving is 3 days away, you have 20 people coming over, and you have not yet begun to get your home ready! Don’t panic! This is familiar territory, we can help you through it. Now that we have had a few nice days (I forgot how GOOD 70° feels! ), we are feeling refreshed and ready to get through the rest of the winter. This warmer weather got us thinking about what we need to do to get ready for spring and summer, and deck maintenance is on the top of our list! The deck is in extension of your living space that, when the weather is right (and bugs are at bay), can be used as much as your indoor spaces. We relax, cook, eat, and socialize on our decks. They are meant for peace and relaxation, and in our busy lives, they give us a means to be a part of nature. It is just as important for us to pay attention to the structure and safety of our outdoor living spaces as it is for our indoor spaces. This homeowner called us when he noticed a bow in the landing on his deck. Needless to say, we found some problems. While we were not able to determine what caused the rot in this pressure treated wood, we were able to replace the damaged wood and repair the stairs without turning it into a huge project. As long as you are paying attention, and call us when you first notice a problem, we can get it fixed before a small problems turns into something bigger. · Regular inspections – every year or two, remove all furniture from your deck, sweep it off, and check for any loose boards or popped nails. · Wash – once you have the area cleared, this is a great time to grab either a strong garden hose nozzle or a power washer and your deck cleaner of choice. When doing this step, it is important to be mindful of the cleaning solution that you are using, the type of wood your deck is made of, and any plants that could be effected (bleach based cleaners and plants are generally a bad combination). · Stain & seal – There are many 2-in-1 product options to make this a singular step. It can be applied with a roller, paint brush, or a paint sprayer (if you choose this option, just make sure you don’t do it on a windy day). If you take care of your home, it will take care of you, but sometimes things out of your control can happen. That is what we are here for. Think warm thoughts and spring will be here before you know it! Hopefully this isn’t news to you (and if it is news, you are doing something right…or you need to get out of the house), but it is COLD. Not just regular cold, but the kind of cold that can be damaging to your home. 1. Order your oil – For those with oil heat, check your oil levels and get that order called in. Heaters are running on overtime, and your regularly scheduled delivery may need to be adjusted. 2. 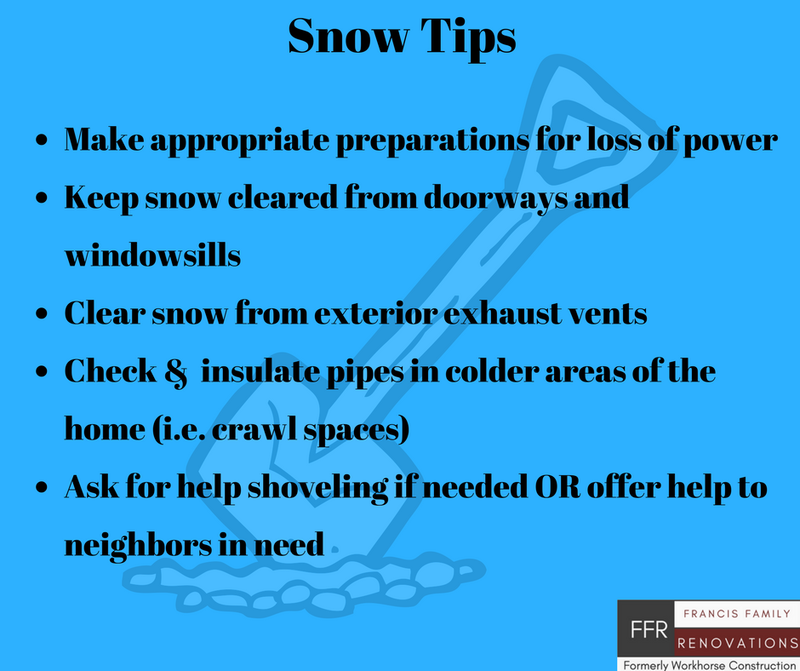 Clear your vents - Make sure any exhaust vents are cleared and free from freeze. 3. Insulate those pipes - Scope out any pipes that could be in non-heated areas of your home (ex; crawl spaces) and get them insulated. You can also purchase a cover for any outdoor faucets and get them covered. 4. Keep the water moving – leaving a slow drip in your faucets many not be great for your monthly water bill, but it will keep your water moving and may help prevent freezing. If you suspect pipes are already freezing and/or develop a leak, do not panic. Turn your water off immediately and call your local plumber. If you don’t have one that you regularly use, give us a call and we will help connect you with someone. A lot has happened in the 15 years that we have been in business! When we went into business, our goal was simple…provide quality home renovation services to our community. As time has passed and we have grown as people, and as a family, our views have shifted about what we do and why we do it. We still want to provide quality home renovations to our community, but it is now more than that. Our understanding of what a ‘Home’ is has changed. It is no longer just a building for us to renovate or repair. It’s the place where you come after a long day. Where you celebrate life’s beautiful victories and learn how to deal with its disappointments. It is where you celebrate holidays and birthdays with friends and family. It is where your pets feel comfortable. And, it is where you raise your children. We have grown from just building a business that will provide renovation services, to growing a business that helps bring to life your dream home (and still fix clogged sinks…). Professionally, we have grown in our skills, and knowledge-base. We survived a recession and continue to thrive as a business. We are incredibly grateful for that and not a day goes by that we do not understand that we are here because of the support of our customers. I run this business with the help of my wife and our children are our every day motivation to make this as successful as possible (aside from the mortgage payment). After some reflection, and evaluating where we are in life, both personally and professionally, we decided that we wanted our name to reflect who we are now. As a result, over the coming months, you will see us transitioning from Workhorse Construction to Francis Family Renovations, Inc. While we will always be Workhorses at heart, we hope that this change in branding will better reflect who we are, what we do, and what we do it for. We will be launching a new website with a new blog, and will be active on more social media platforms. Just give us some time on social media…there is a learning curve with Twitter. We are excited about this transition and look forward to the next 15 years and genuinely hope that all of you will be a part of it.